Along with this kick off event, PAC’s mission for the year ahead includes numerous events and conferences and the formation of three advisory boards comprising leaders in youth sports, research and medicine, and professional athletes. PAC will also be active through social media in order to spread its message of awareness, inspire involvement and recruit new partners. 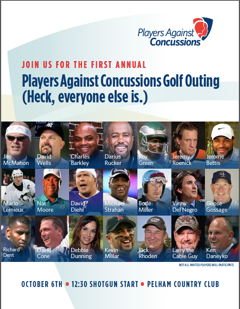 For more information on PAC, or to request RSVP for the October 6th Players Against Concussions Golf Outing, please contact Mark Ballard or Sabrina Levine at 212-680-0179 or email RSVP@channelvmedia.com. PAC was created for the advancement of awareness, prevention and treatment of head and neck trauma due to concussions. PAC is a pro-sports organization that is dedicated to making all sports, at all levels, safer through raising public awareness and committing funds to research and education. The brainchild of a group of former professional athletes, PAC is headed by former NFL player Jim McMahon and former NHL player Jeremy Roenick who have seen and experienced the damaging effects of head and neck trauma from concussions. Let’s hope this is not ” A N O T H E R ” ( group of the greedy ) , Concussion Companies begun out there , trying to explain how to ” FIT ” a helmet properly , or , WHOM to call AFTER your CHILD has had a concussion , but a group , ( not funded by the ” big leagues below the table ” ). These ” BLOOD SPORTS ” need to be changed , now . The training of coaches , and emphasis has to return to a fun , learning , ” RESPECTFUL” environment . And not a win at all and any cost price . We would truly be shocked at how many children we lose both in dying from , and long – term suffering , OF , concussions , If the ” ON THE MOST PART ( ? ) ” media controlled , ( THESE ARE BILLION DOLLAR business’s ) , were to report every child’s death , or serious injury from a youth football or hockey game ……. To the officers, planners, and advocates for Players Against Concussions, I submit this note with great respect and enthusiasms. Your dedications, information sharing, and outreach efforts are appreciated, by parents, leaders, trainers, potential players and many others. My thanks to Otis Ray Wilson and everyone else – involved in this noteworthy campaign. My first serious injury was at age nine while racing my brother on bikes down the hill…. This was before bike helmets in 1978….